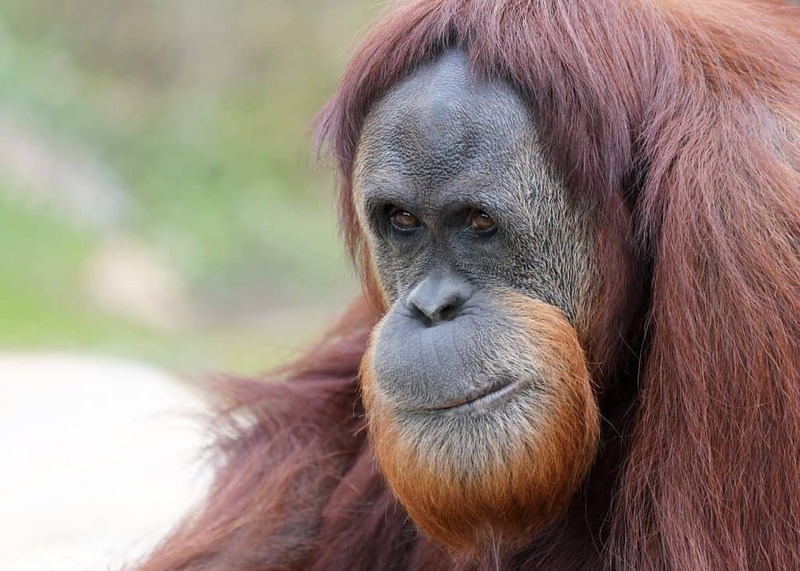 Orangutans are commonly called ‘red apes’ as they have a long, soft orange hair. Their skin is dark grey. You can spot a distinction in the height, varying from 1,30 m to 1,80 m, but the great difference appears in the weight, that ranges from 30 to 90 kg. An adult male may be three times heavier than an adult female. Orangutans are the world’s largest arboreal animals. As they mostly live high in the trees, they have developed long arms (up to 2,25 m) to help them swing through the forest. Both their feet and their hands are incredibly dexterous and they have opposable thumbs like us, making it easier to pick and peel fruits. They are unique among apes in having an unusually long male developmental period and two distinct adult male morphs (flanged and unflanged). As they mature, some males develop fleshy cheek pads and throat sacks, which will allow them to produce long calls to attract females. However, in some individuals called sub-adults, the cheek flanges and muscle mass are either not developed or full development may be delayed until they are over 30. Their body is usually smaller. It is not fully understood exactly when and why a mature male undergoes the transformation from unflanged to flanged. It has been hypothesized that the existence of a dominant flanged male within a range of an unflanged male inhibits its development. So, the unflanged male won’t develop his cheek pads and large size until the dominant flanged male dies, moves away, or is defeated; or himself moves away. 10% of the sale price of this neckwarmer is donated to the NGO Durrell Wildlife Conservation Tust. For further information about the work carried out by Durrell, take a look to this page. Only around 13.800 individuals left. The majority of Sumatran Orangutans are found in the Leuser Ecosystem (provinces of Aceh and North Sumatra). Historically, Pongo abelii was spread over the entire island of Sumatra and further south into Java. Their habitat has now been reduced to the north of the island, mostly in the provinces of North Sumatra and Aceh. Female lifespan ranges from 44 to 53 years in the wild. Male lifespan is slightly longer, 47 to 58 years. Orangutan males are ready to mate when they are approximately 15 years of age, while females are fully mature at an average age of 12 years. Heavy fruiting months result in a higher mating rate. Both male and female mate with several partners. The two distinct adult male morphs (flanged and unflanged) generally employ different reproductive strategies. Flanged emit loud booming ‘long calls’, presumably to attract receptive females as well as to let other males know their whereabouts. Matings between females and dominant flanged males are generally cooperative. Instead, sub-adults mating tactic involves harassment of the females, as they seem to be less desired than the fully developed males. Females are cornered by sub-adult males and enforced to mate. As a consequence, females have developed strategies to avoid or reduce harassment, like forming non-mating parties with flanged adult males or alliances with other females to protect themselves. The first infant usually comes when females are 15 years old. They then have one every eight or nine years, becoming the mammal with the longest birth interval. Gestation lasts about eight and a half months and birth takes place in a newly-made nest near a tree top. Twins are not common among Sumatran Orangutans. The development of infant orangutans takes so much time. Orangutan infants cling to their mothers for the first one to two years of life, traveling as one through the trees and sleeping in the same nests. The next two years, they will learn to climb and start exploring, always near its mother’s protection. It is when the family welcomes a new baby, that the elder sibling begins to travel apart of its mom and sleeping in its own nests. However, it will keep visiting her every few days. Males do not play a role in offspring care. All this means that the population of the areas affected by habitat loss takes a very long time to recover. Pongo abelii individuals are extremely intelligent. They share over 96% of our own DNA. In Sumatra, they use small branches to build tools and use them to extract honey and seeds from difficult places. Orangutans learn and teach each other new skills; scientists have even taught them communication abilities, such as human sign language and the use of computer touch screens. Moreover, they are able to see a situation through another’s eyes, showing empathy. Sumatran Orangutans have closer social ties than Bornean Orangutans. This has been attributed to mass fruit on fig trees, where groups of Sumatran Orangutans can come together to feed, not worrying about the amount of available food. Adult males are typically solitary while females are accompanied by offspring. Grooming as a social interaction is not common through the Sumatran Orangutans, but play has been recognised in adults and juveniles. Actual contact is not always necessary, sometimes simple body language is used as play. They also have unique and diversified cultures. The building of the nests is an example of this, as each individual has one manner of doing so. Sumatran Orangutans would have been threatened by numerous predators on the forest floor in the past, and have therefore evolved to exist almost only high in the trees. The most prolific natural predators of this species are the Sumatran Tiger and the Clouded Leopard, but their population has declined due to hunting and habitat loss. Modern humans have now become the main predator for orangutans. Until recently it was thought that only two species of orangutan existed: the Bornean Orangutan (Pongo pygmaeus) and the Sumatran Orangutan (Pongo abelii). However, a team of international scientists described in 2017 a new species of orangutan found in Indonesia. It is called Tapanuli Orangutan (Pongo tapanuliensis). This species is endemic to the three Tapanuli districts of North Sumatra and occurs in roughly 1.100 km2 of upland forest in the Batang Toru Ecosystem. It appears to have been isolated from all other Sumatran populations for at least 10.000 to 20.000 years. With no more than 800 individuals, the Tapanuli Orangutan is the most endangered of the great apes. 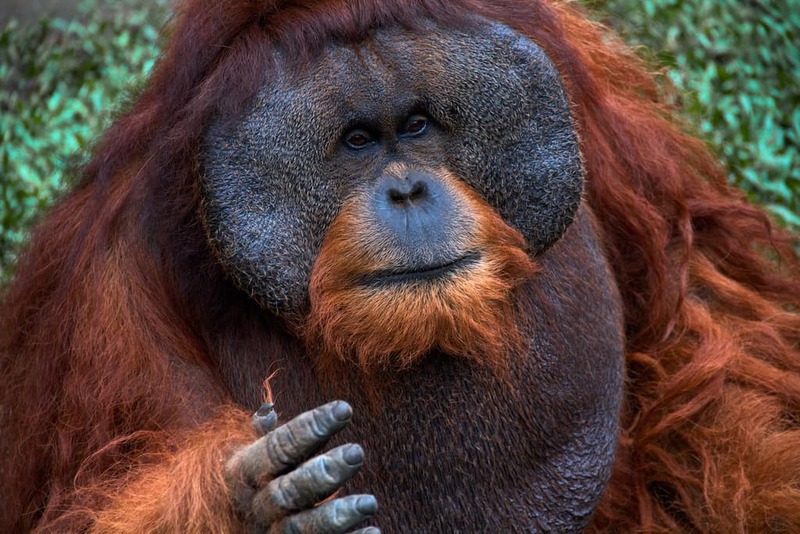 Sumatran Orangutans have longer facial hair and closer social bonds than their Bornean cousins. Moreover, the Sumatran Orangutans are almost exclusively arboreal; while Bornean more often descend to the ground (especially adult males). The Sumatran Orangutan is almost exclusively arboreal, choosing the trees of tropical rainforests. Some adult males travel through the ground, especially the largest; but females virtually never do so. This species prefers lowland valley forests, as the variety of food is greater. However, it can be found at higher altitudes, with a few small populations known to exist above 1.000 m over the sea. Males’ home ranges overlap with the ranges of several adult females. Females share areas with a range from 500 to 850 ha, while males dominate a minimum range of 2.500 ha. Pongo abelii individuals have a diurnal lifestyle. Their day begins at sunrise and the first thing they do is feeding for about three hours in a nearby tree. They then start travelling and collecting more food items until midday, when they rest for an hour before travelling again during the afternoon in order to find another fruit tree where they will eat for a couple of hours more. Around 4 or 5 pm, it is time to retire to sleep. To do so, Sumatran Orangutans make leafy nests in the trees. These nests are newly made every day (occasionally they will repair an old one they find). In contrast to Bornean Orangutans, the Sumatran even make another one around midday to take a nap. When there is rain, they often make a kind of roof from branches and leaves. Fruit is the main part of a Sumatran Orangutan’s diet and figs are their favourite. However, they also eat young leaves; liana and palm stems; insects, especially ants and termites; and occasionally tree bark. They have also been seen eating meat from small vertebrates, but this is rare. They use their teeth to tear and grind the food. The liquid needs are covered by the vast amount of fruit that they eat, but they also drink from water sources, collecting it in their cupped hands. Their senses of sight, taste, hearing and touch are pretty much like ours. To communicate, they do a sound like a ‘kiss squeak’, mostly when they are anxious or afraid. Also when they feel anger, but then they will add some ‘grumpfs’. The flanged males make what it’s known as ‘the long call’, a series of exceptionally loud roars followed by a bellow that can be heard at a distance of around 1 km. This is used to attract females and scare away potential rivals. They may also pull small trees and limbs down to add a crashing sound. Young orangutans frequently squeak, bark, and scream. Pongo abelii is considered one of the world’s top 25 endangered primate species. Estimates of remaining orangutan numbers have declined dramatically over the last two decades due to habitat loss and fragmentation, despite being protected by law. Hunting of the Sumatran Orangutan still occurs as well. Palm oil plantations, logging for timber, and mining concessions are the main threats. The last threat is the construction of new roads proposed within the boundaries of Sumatra’s last great rainforests. 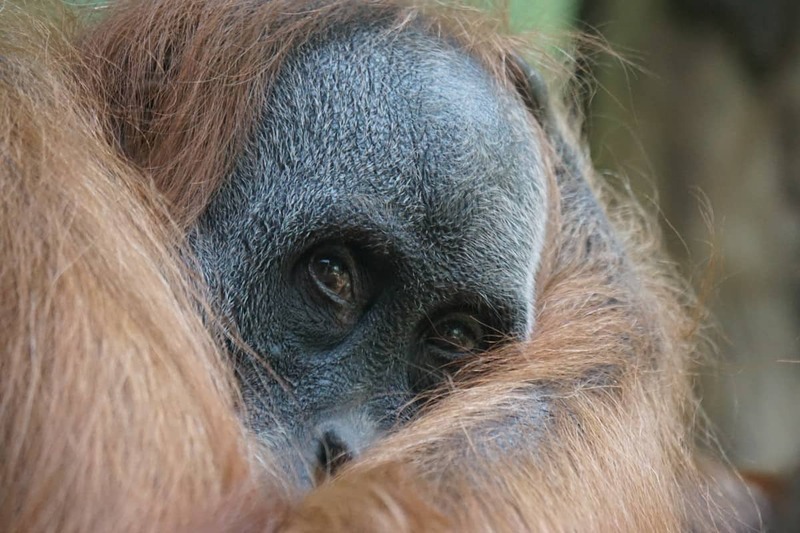 This will fragment the habitat and the orangutan populations they support into even smaller, potentially non-viable units, as they are left with not enough resources to survive. They are killed by plantation workers when they steal fruit crops in search of enough food to survive. Moreover, some people in Indonesia and overseas are still willing to pay high prices to purchase young orangutans, which is illegal since 1931. This is not only a threat for the young orangutans, their mothers usually fight for their child to the death. In fact, it is estimated that for every orangutan sold, six to eight die in the process of capture and transport. As a result, only seven of the nine existing populations of Sumatran Orangutans have prospects of long-term viability. However, more than 260 individuals have been reintroduced to date with the objective of establishing new genetically viable and self-sustainable wild populations. Evaluated by the IUCN Red List of Threatened Species as Endangered (2016). 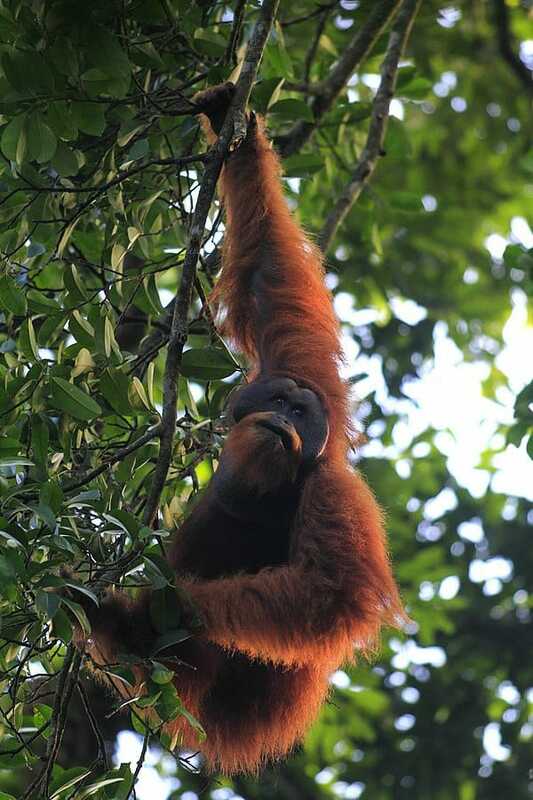 In Malay ‘orang’ means ‘person’ and ‘utan’ is derived from ‘hutan’, which means ‘forest’. So, orangutan literally means ‘person of the forest’. Orangutans are well known as the most adept tool users of all the animals, including the other apes, and the best escape artists too. 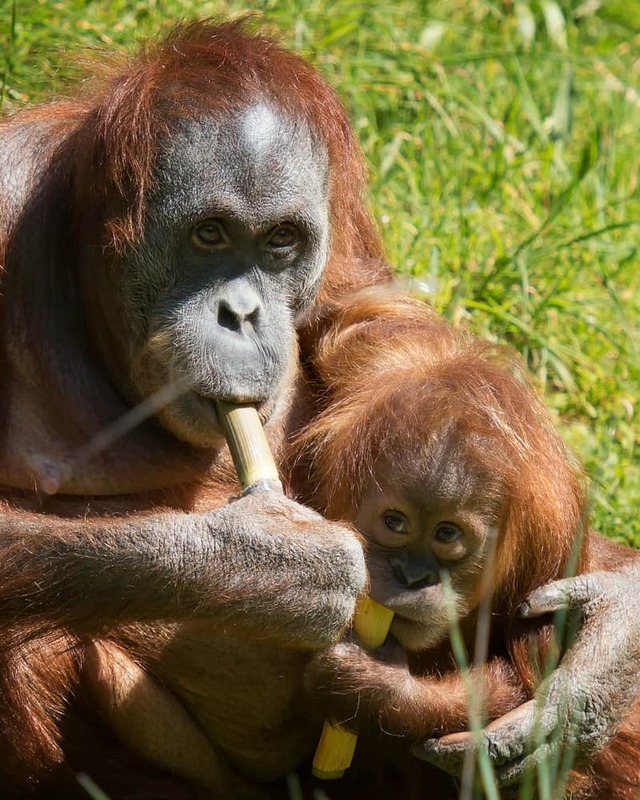 Orangutans have the longest birth intervals among mammals. Orangutan babies keep visiting their mother after 10 years. Orangutans have a wide range of facial expressions thanks to their very flexible lips. 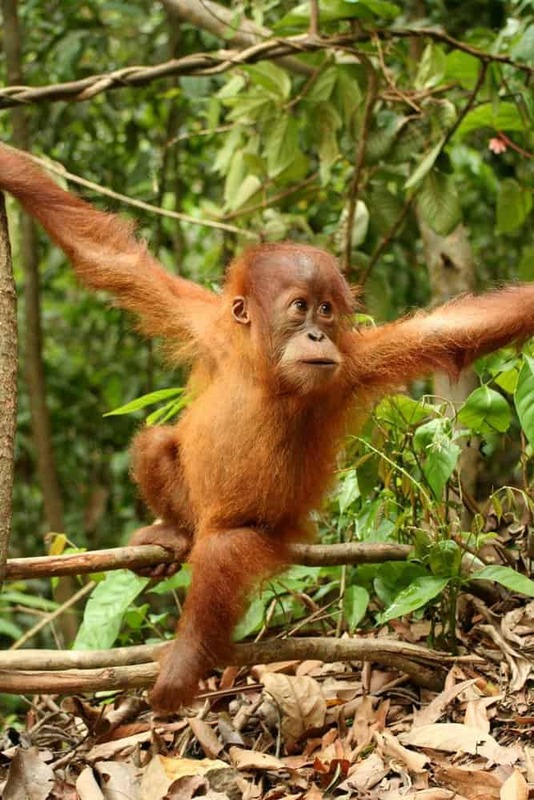 Orangutans’ arms stretch out longer than their bodies. Orangutans breeding is most intense in mast fruiting years.